PEACEFUL. 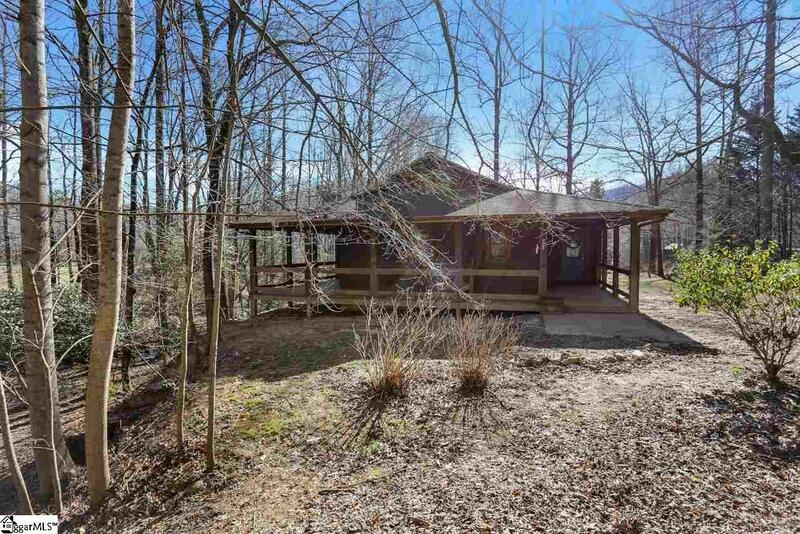 That is the first thing that will come to mind the minute you walk into the beautiful cabin retreat. Sit around for hours on the spacious wrap around porch that overlooks the gorgeous creek bordering the 1.23 acre lot. Walk into the front door into an open concept living area and cozy up on your couch next to the beautiful wood burning stove. This stove is top of the line and has extra features that most wood burning stoves do not support. Add this with the floor furnace supported by propane gas, and you're nice and warm on those cold winter days. The character in the home is something that truly needs to be seen in person. Hardwood floors meet stone, brick, and tile in the kitchen and bathrooms, which give the perfect cabin feel throughout the house. Massive mudroom/laundry room plus walk in closets in both bedrooms and a walk in pantry off the kitchen all help to give additional storage to this beautiful property. The house is perfectly located within 35 minutes from Greenville, 35 minutes to Asheville, 20 minutes to Hendersonville, and 20 minutes from three state parks. This home would be perfect to rent out for Airbnb, VRBO, or have a second house to escape to during those times you just a break from the hectic schedule of life. Trust me when I say that the trickling sound of the creek plus the relaxing sounds of nature from the porch can soothe any soul. Once you visit this cabin, you will fall in love. Come call this your home!